E. Hagnauer dess. et lith. A blueprint of a repeating filet pattern, flowers and leaves. Also suitable for filet crochet and cross-stitch. Probably a supplement from one of the ladies magazines. Scan donated by Renko Kuperus, charted by Sytske Wijnsma. Milano - Casa EditriceSonzogno - Milano. Donated by Iva Innocenti, edited by Yvonne DeBandi. 32 page booklet of charted designs for lacis (darned square-mesh net), published by Casa Editrice Sonzogno, Milano. Third album about filet lace. Some of the square designs intended for use in assembled hangings were adapted from historical sources. Includes classical, floral, and devotional designs. Also includes designs for cutwork whitework and needle lace inserts, to use in combo with the lacis pieces. The charts can also be used for filet crochet and cross-stitch. Insegnamento pratico illustrati di Adele Della Porta - Album 1. 40 pages of detail photographs of darned net (filet) pieces. in most cases, clear enough to work from. Can also be used for filet crochet or other graph-based work. Italian instructions on making the net ground, mounting it for stitching, and for filet darning. Some particulary large and elaborate designs as well as three that can be traced back to the late 1500s (Figs. 28, 30, 42/43). No citations provided. Designs for strips/borders/insertions, plus round and oval center motifs, and a paricularly elaborate armchair set (antimacassar). Photos of three small lace doilies. Two are square silk Maltese bobbin lace, and one is a round of knotted darned filet lace, in linen. No working directions. Birds, cupids, winged horses, flower urns, Jeanne d'Arc, rural activities in the four seasons, fairytale scenes, dancers, mythological animals, all decorating a variety of objects. Collars, purses, curtains, portieres, doilies, lace caps, and of course lots of Birds, cupids, winged horses, flower urns, Jeanne d'Arc, rural activities in the four seasons, fairytale scenes, dancers, mythological animals, all decorating a variety of objects. Collars, purses, curtains, portieres, doilies, lace caps, and of course lots of borders, corners, and medaillons. The second Filet Ancient book, printed in 1913. Charted designs for darned net (filet), also useful for filet crochet, cross-stitch, and voided embroidery (Assisi). More strips, insertions, borders, corners, swags, and large motifs. The life of Joan of Arc, heraldic beasts, cherubs; folk tale scenes; cherubs and nymphs; Aesops fables; devotional motifs; Greek and Roman mythic figures; lords and ladies and court life; birds, beasts, flowers, and geometric/scrolling ornament; Night and Day; hunting scenes; procession of the Saints; and more. Scans donated by Tamara Tiekstra, edited by Sytske Wijnsma, charted by Franciska Ruessink. Volume 3 from the well-known Filet Ancien series. Charted designs for darned net (filet), also useful for filet crochet, cross-stitch, and voided embroidery (Assisi). Motifs include classical Greek/Roman gods, heroes, and cherubs; Egyptian heiroglyphics and ornament; geometric and floral borders, strips, corners, and ovals; Renaissance formal beasts and birds; cornucopias, urns and baskets; months of the year; kings and knights; a panel of celtic entwined beasts; the four seasons; a majestic dragon; and what looks to be a coat or jacket. Modern re-charting provided for ease of use. Cupids, fables, Greek gods and goddesses, the Tapestry de Bayeux, all in monochrome patterns suitable for filet, but also for crochet and cross-stitch. Scans donated by Tamara Tiekstra, edited by Sytske Wijnsma. Charted by Franciska Ruessink. Seven charted geometric designs excerpted from the Filet Ancienne au Point de Reprise, Volume I, page 16. Charts intended for filet (darned net), can also be used for cross-stitch, filet crochet, and other graph-dependent forms. Easy-to-read modern redo of the charts is provided. No text. Album no.5 Cet Album contient de nombreux Modeles de tous styles pour ameublement. Large collection of charted designs intended for filet (net darning) or filet crochet. Some can be adapted to cross stitch. Designs include devotional items, floral otifs, classical scenes, geometrics, chinoiserie. Also designs for tape lace (Battenberg). Many designs include thumbnails of intended decorative use. Charts for filet (darned net) with densities of weave indicated (Hungarian Filet). Can be adapted for multicolor filet crochet. Very large vignette designs presented on small pages: parlor knitter, punting on the river, formal silouette, barnyard chicken, plus assorted geometric and floral borders, some with corners. Original specifies 6 big pages, and one double page, but only 5 plates remain. Scans donated by Sytske Wijnsma, edited by Judith Adele. Two planches charted by Sarah Duehr. Paris, É. Boucherit, [c.1908], [missing pages 4,8,43]. Filet charts for crochet, beading, embroidery on net, etc.. Formal and floral designs, birds, mythical creatures, church motifs, Japanese inspired scenes, in edgings, large squares for centerpieces. Scans donated by Yvonne de Vries, remastered by FireRose. Charted design for a square motif featuring pineapples, intended for filet (darned net) and to be inserted in a tablecloth. Can also be used for filet crochet or cross stitch. A single filet square, geometric border around a rose. From an Army-Navy tablecloth, filet squares in a chessboard pattern, the other squares embroidered in whitework in a similar pattern. Chart only. Charts for filet (darned net) lace. Includes very large pieces plus corners to make up showpiece table linens or curtains. Elaborate borders, insertions, corners, with some classical elements, some Chinoiserie. Panels for door and window curtains, bedspreads. Many but not all of the plates are detailed enough to work from. Designs can be adapted for filet crochet, and cross-stitch. Scans donated by Alie Feichtinger, edited by Judith Adele. Photographs of filet (darned net) lace, many detailed enough to work from. Designs can be adapted to filet crochet or cross-stitch. Examples include borders, corners, round, rectangular and square pieces with mythical beasts, classical ornaments, and flowers. Four panels of kings and queens with heraldic identification. Nymphs, cherubs, four seasons set, adorable small motifs of birds, animals, and insects. Scans donated by Alie Feichtinger, edited by Alie Feichtinger. 50 Modèles Inédits Collection DAe Album No. 5 Les Dentelles De Lin. Plates of embroidery on filet clear enough to stitch from, also could be used for cross stitch or filet crochet work. Astrological and mythological motifs, Louis IV era designs, playing card designs, borders, floral motifs. Boucherit, E. et Cie, ed. Plates of embroidery on filet clear enough to stitch from, also could be used for cross stitch or filet crochet work. Borders, scenes from Aesop's Fables, animal and mythological motifs, quaint and exotic scenes. Künstler Vorlagen für Filetarbeiten und Handstickereien. Filet illustrations for squares, medallions, edgings, - geometric and classical designs, with photographs of their use as inserts in household linens. Original Designs Which May Be Used Also For Cross-Stitch and Beadwork, with Patterns Represented in a New Way, Preface and Suggestions for Making Up designs by Cora Kirchmaier. Toledo, Ohio, Cora Kirchmaier, 1914, 38 pgs. Dresser cover, "Love Bird" pillow and sofa cover, work bag, altar cloth edgings, tea cozy, cake cover. New Braunfels, Texas, Augusta Pfeuffer, 1917, 15 pgs. Charted patterns for filet crochet insertions and edgings, for use on lingerie, tablecloths, doilies, and edgings. Includes a hippogrif adapted from a 16th century work, a script alphabet, and lots of corner designs, wide and narrow borders, single motifs. Charts can be used for cross-stitch, beading, voided work, and other styles that employ graphed designs. Scans donated by Debra Carr, edited by Judith Adele. J&P Coats Filet Crochet Book No. 4. Pawtucket, R.I., J&P Coats, 1920, 23 pgs. Exquisite crocheted vests, gowns, filet charts, boudoir jacket, yokes, slippers, cap, church laces, shawls, sweaters, table runner and chair back. Home Needlework Filet Crochet Book. Boston, Home Needlework Publishing, 1916, 20pgs. Crocheted bags, wonderful filet charts, doilies, baskets, bags. Brookline, Mass., M. E. Fitch, 1914, 30 pgs. Edgings, insertions, and squares for doilies, curtains, bedspreads, napkins and household items. Scan donated by Debra Carr, edited by Judith Adele . Illustrated with instructions, Book No. 14. St. Louis, Missouri, Valley Supply Co., 1921, 15 pgs. Yokes, edgings and bedroom caps, baby caps, tray cloth, monograms, cluny lace doilies. The filet patterns include a large butterfly, a peacock and patterns for Elk Lodge, Modern Woodmen of America, Shriners. Original Designs Which May Be Used Also For Cross-Stitch and Beadwork, With Patterns Represented in a New Way by Hugo W. Kirchmaier. Toledo, Ohio, Cora Kirchmaier, 1912, 37 pages. Filet edgings and insertions with instructions - formal and floral designs, an unusual seafood table linen pattern with lobsters and crabs, butterfly and bee insertions, birds, animals, alphabets, japanese motifs. Brookline, Massachusetts, 1915, 28 pgs. Panels, edgings, insertions - some nice ones with animals and people, doilies, yokes, and an alphabet chart. Brookline, Massachusets, 1915, 28 pgs. Doilies, edgings, insertions, chair back, medallions, alphabet. Original Designs with Directions for Working. Chicago, Richardson Silk Company, 1915, 32 pgs. Collars, doilies, baby caps, booties, filet patterns, yokes, edgings, insertions, bags. St. Louis, Missouri. E.C. Spuehler Publisher, c.1915, 15 pgs. Filet charts of birds, patriotic, church and traditional motifs. [Berlin?, Heinrich Kuehn?, c.1880] 20 plates. Charted alphabets, borders, fields, motifs; cross-stitch with other stitches. Scans donated by Ramzi Ghezawi, edited by Judith Adele. Casa Editrice Sonzogno, Milano, 1905, 63 pages. Italian language collection of charted designs intended for filet (darned net); some are suitable for cross-stitch, filet crochet, and voided work (Assisi embroidery). Some photographs of finished items or use suggestions. Kreuzstitch und Filetmuster aus Graubünden. Herausgegeben von der Bündnerischen Vereinigung für Heimatschutz. Gedruckt bei Bischofberger & Hotzenköcherle, Chur Zürich, 1927 (some plates missing). Cross stitch and filet instructions in vol. 1, illustrative plates in vol. 2, charts in vol. 3, many based on medieval, renaissance and neo-classical patterns. Scanned Yvonne deVries, edited by Judith Adele. Charted designs for darning on net (filet); also suitable for cross-stitch, voided work, and filet crochet. Mythical beasts, knights and ladies, musical instruments, cherubs, geometric and floral borders, allegorical figures, and more. Many designs are adapted from older examples, but no sources are cited. Shelby, N.C., Lily Mills Company, 1958, 16 pgs. Filet crochet and embroidery charts for doilies and household items. Leipzig: Verlag Otto Beyer, 1921, 38 pgs. Victorian-style designs, including cherubs and church patterns, for embroidered net, with netting and stitch instructions. Large charts, good for filet crochet and cross-stitch, are in the second pdf file. Florence, Mass., Nanotuck Silk Co., 1920, 48 pgs. Crochet stitch instructions, including more complicated stitches such as roll stitch and star stitch. Patterns for crocheted silk men�s ties, a knitted tie, doilies, luncheon sets, filet patterns, some exquisite edgings, tatted baby items, scarves, yokes, caps, patterns for doll items. A Collection of Beautiful Designs in Filet Crochet Equally Adapted to Cross-Stitch, Beads and Canvas, with Working Directions. Boston: Priscilla Publishing, 1911, 48 pgs. Excellent advice on filet crochet, directions for pillows, doilies, edgings, bedspreads. Many charts, including peacocks, heraldic dragons and lions, hunting and mythological scenes, alphabets. Florence, Mass. : Corticelli Silk Mills, 1917, 64 pgs, missing pgs 25,26,39,40. Boston, The Priscilla Publishing Company, 1915, 48 pgs. Many filet charts - church motifs, peacock, animals, birds, flowers, cherubs, fruit, motifs for children, formal borders and corners, the Selkirk Grace lunchcloth, and Tallyrand coffee cloth. Lille, France, [c.1900], 34 pgs. Plates illustrating darned net (filet), but also suitable for cross-stitch and filet crochet. Most of the plates are clear enough to work from. Includes borders, squares, scenes from fairy tales, myths, lords and ladies, the virtues, some Roman gods and heroes, heraldic beasts, and classical cherubs. A few of the designs can be sourced to 16th century modelbooks, but they are not attributed. Booklet of Designs and Instructions for Making Teneriffe and Filet Lace. Viroqua, Wisconsin: Proctor Teneriffe Lace Wheel Co., 1903, 46 pgs. Variety Italian Cut Work and Filet Lace Book No. 1. Boston: Carmela Testa & Co., 1921, 36 pgs. Simple charted designs to use with a variety of needlework techniques, which are also illustrated and described Italian Cutwork, point lace, netting, filet lace and filet crochet, drawn thread work. An interesting tassel design for a bag. Needlecraft Vol. XI, No. 1, September 1919. Spectacular �spider� pattern crocheted collar. Needlecraft Vol. VII No. 8, Apr 1916. Augusta, Maine: Needlecraft Publishing, 1916. Crocheted drawstring handbags. Introduction calls out dual use of cross stitch and filet designs, but no charts are provided. Patterns for four bags, one with a monogram. St. Louis, Missouri: Valley Supply Co., 1912, 15 pgs. Edgings, medallions, squares and camisole yokes, including spider and filet patterns. Needlecraft Vol. II No. 5, Jan 1916. Augusta, Maine: Needlecraft Publishing, 1916, p 11, 21. Seven original crocheted doily patterns, one filet and several with Irish Crochet elements. Needlecraft Vol. VIII No. 12, Aug 1917. Three doily edges, including a filet cloverleaf and a 5-point star motif. Edouard Boucherit, 10 rue de la Pepiniere, Paris. 32 pages, oblong softcover with filet patterns, mainly little cherubs. No date. Charted by Franciska Ruessink. Transferred to Rijksmuseum Research Library, 2019-01-18. 36 pages, photos and many charts of filet patterns. Boston, The Priscilla Publishing Company, 1914, 48 pgs. Scans donated and edited by Sytske Wijnsma. Ouvrage accompagne de nombreuses recettes tres explicatives au sujet de la fabrication du filet uni et du filet brode. De jolis modeles anciens et modernes ses'adaptant a ces ouvrages completent ce recueil. Description of various techniques and stitches related to filet, how to knot and embroider filet with many small patterns and some larger ones. The publication shows no author or year of publication. Estimated end ninetheenth century based on patterns, paper quality, and binding. 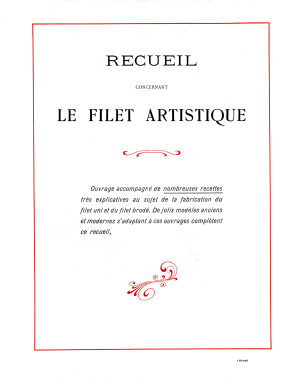 The cover is papered over but shows faintly the title Dentelle au filet. Scans donated by Tamara Tiekstra, not edited yet. Augusta, Maine, Needlecraft Publishing Co.
From the collection of Janice Lee, not scanned. New York, Bernard Ullmann, 1916, 47 pgs. Boston, Italian Industry Carmela Testa & Co., 1926, 37 pgs. Embroidered cutwork lace, Point Lace, with many pattern drawings, cross-stitch and filet charts. Wonderful. Brookline, Massachusetts, 1914, 32 pgs. Doilies, cushions, edgings, insertions, bag, curtain. Scans donated by Public Domain Tatting Archive, edited by Judith Adele.